We arrived in Cincinnati OH late, tired and hungry. We checked into the Residence Inn Downtown, had dinner in at the Phelps Bar in our hotel, then got a good night’s sleep. This morning we’re crossing the Ohio River into Kentucky to visit the Newport Aquarium. This 100,000 sq. ft. building at Newport On The Levee rests on the banks of the Ohio River, directly across from downtown Cincinnati. 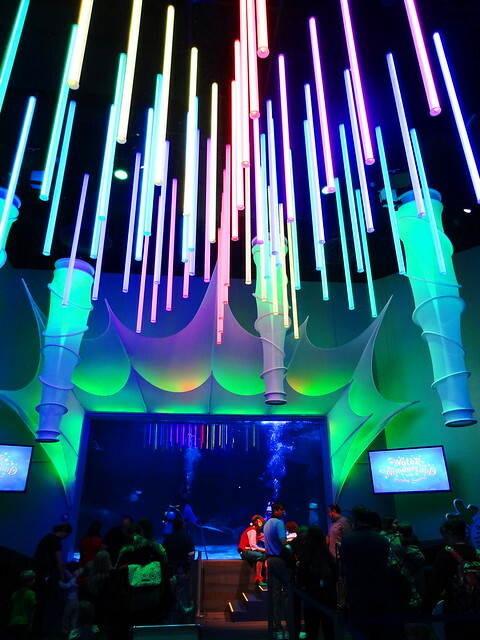 The aquarium has specially designed underwater tunnels that give you an up-close look at marine life, it’s pretty impressive. We park in the structure, ride the elevator up to the deck where it’s cold and raining. A tent has been set up to shelter those of us zigzagging through the line to purchase tickets; it seems everyone had the same idea today. We begin at the World Rivers exhibit showing us life in 9 different rivers on 5 continents. We move from tank to tank, the fish seem to be as interested in us as we are in them. At the Shore Gallery grown-ups and children are all eager for a chance to pet a horseshoe crab, a whelk, touch a Sea star; a young woman demonstrates the two-finger method of touching. 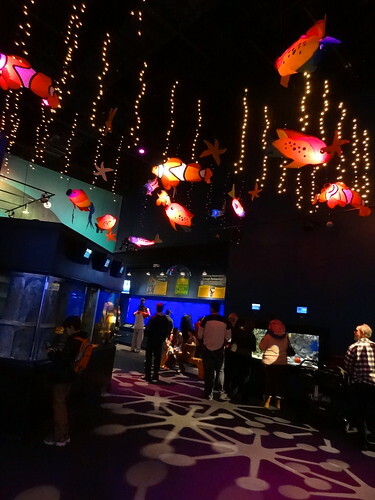 We follow the pre-determined path past tank after tank of fascinating creatures, large placards explain what’s inside the tanks, illuminated fish and starfish mingle with dangling lights overhead–in here, everybody is a kid. The Coral Reef tank is burgeoning with colorful fish, a Morey eel and Cownose Rays with 2-foot wingspans. 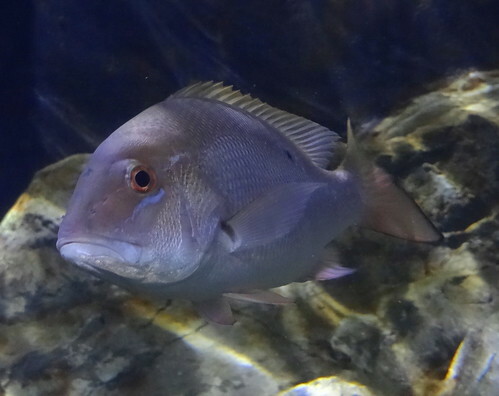 The fish in the Dangerous and Deadly tank really do look creepy! 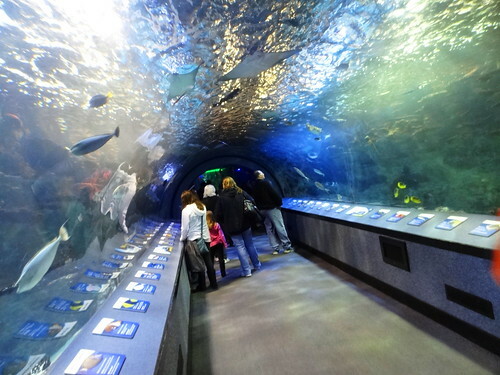 117,000 gallons of freshwater fill the 32-foot-long acrylic tunnel featuring fish from the Amazon. Room to room, section to section we go seeing the Frog Bog filled with exotic frogs, Gator Alley, where Snowflake and Snowball, 2 White American Alligators live–be sure and check out Mighty Mike at 14 feet, weighing 800 pounds. 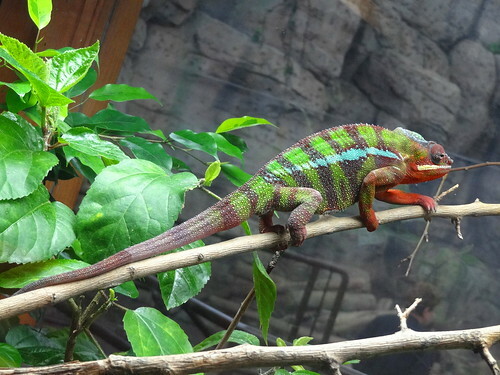 Snakes, lizards and a fabulous Panther Chameleon all call the aquarium home. The otters are sleeping when we show up at Canyon Falls, bummer, people of all ages are checking out the Turtle Corral, you can even touch a tortoise. 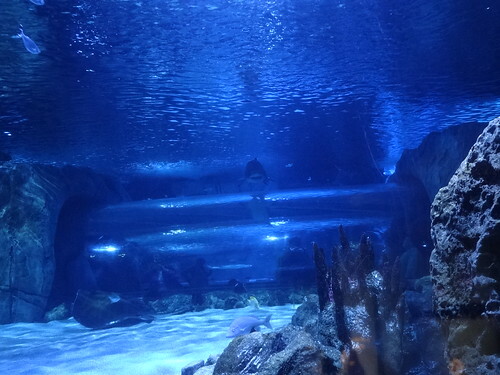 Scuba Santa is putting on a show in the theater area, this is one of the largest windows to view the giant shark tank. 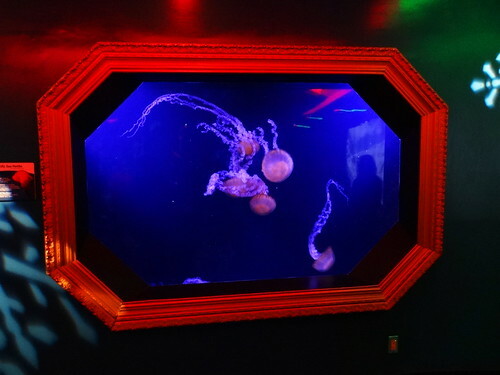 For us the seamless acrylic tunnels are the main attraction; it’s a strange feeling to be surrounded by sharks, sting rays, and a variety of marine life. Everybody takes the same photograph, the shark swimming directly overhead, it’s fun to watch. Where the other fish and turtles seem mildly amused by our presence the sharks just give us that cold, dead stare as they glide by. 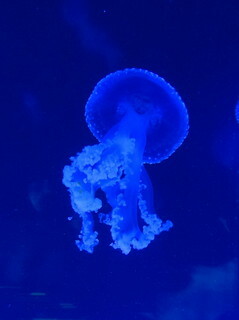 The Jellyfish Gallery is pretty cool, more than 100 jellyfish from around the world capture our attention with their unique shape, the way they move inside cleverly lit tanks.Then there’s everybody’s favorite, the penguins! 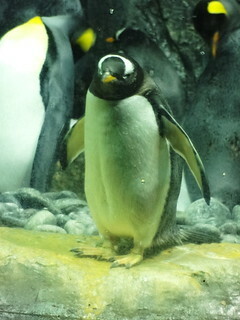 Penguin Palooza is home to 5 species of cold-weather penguins, they’re so much fun to watch. 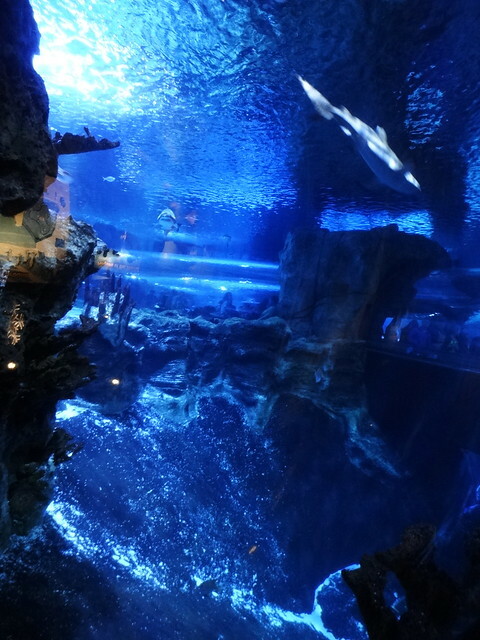 Newport Aquarium now offers a walk along the top edge of the shark tank, the shark tank overlook. 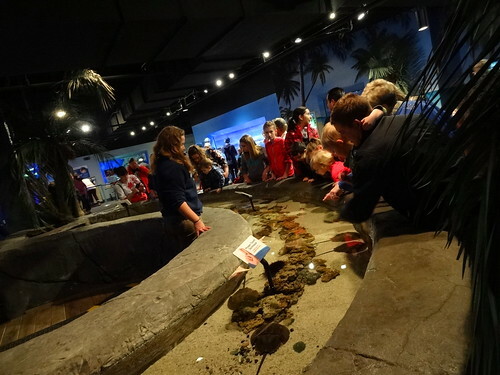 Here you can view 2 dozen sharks, 4 exotic shark rays, 2 sting rays, and more than 300 fish. 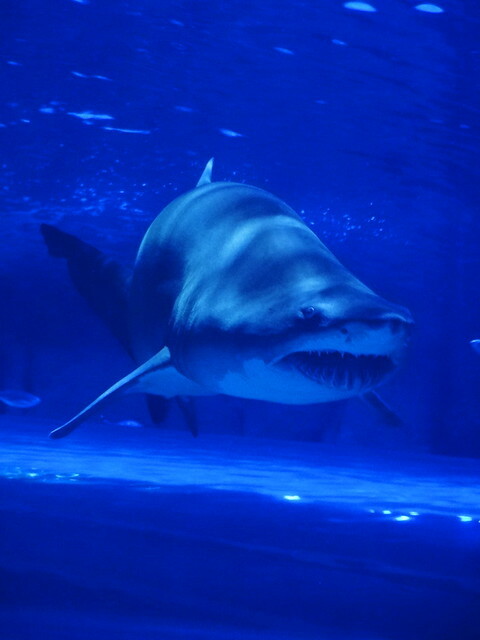 If you are so inclined you can even cross the “shark bridge”, a 75-foot long v-shaped rope bridge strung across the tank.We try and get to the aquarium every couple of years, there’s always something new, and we’re never disappointed. Outside the rain has let up, we make our way to the Newport On The Levee Riverwalk and take in the view. 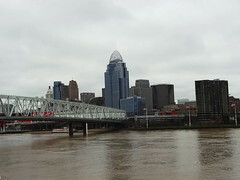 Here we overlook the mighty Ohio, after days of rain the water level is high, multiple bridges criss-cross the waterway, to the right Mt Adams rises above downtown Cincy, skyscrapers dot the skyline. 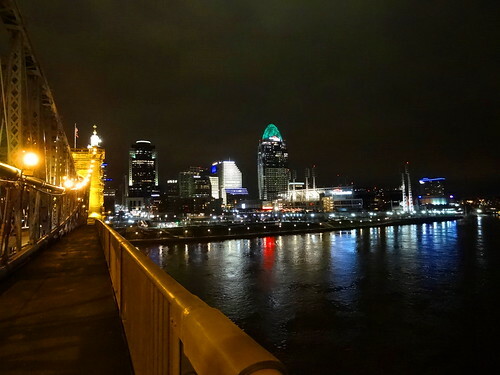 Next we leave the city of Newport, cross the Licking River and arrive in Covington KY. Founded in 1815 this is the largest city in Northern KY. 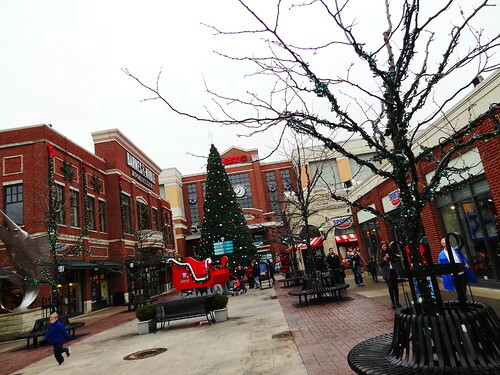 There are 16 historic districts; gorgeous neighborhoods include Licking-Riverside, Mainstrasse Village and Wallace Woods– the area is steeped in historic structures. 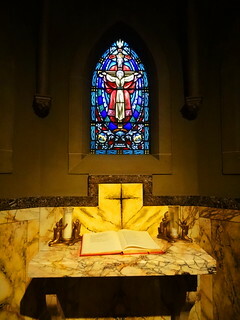 St Mary’s Cathedral Basilica of the Assumption is located on Madison Ave, we’re going to tour the building, c’mon in. First a little history. Construction on the building began in 1894 and ended in 1915. 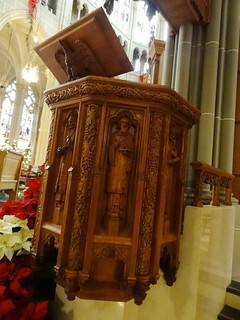 The sanctuary was designed by Detroit architect Leon Coquard, inspired by Notre Dame in Paris. Vaults, columns and walls of the nave, transept and apse were finished in 1897. January 1901 the second stage of construction concluded, funds were depleted. A plain brick wall closed the nave and plain glass windows were installed for the dedication January 27, 1901. Once more funds were raised; the facade was completed in 1908, stained glass windows were installed in 1910, the interior beautification was finished in 1915. 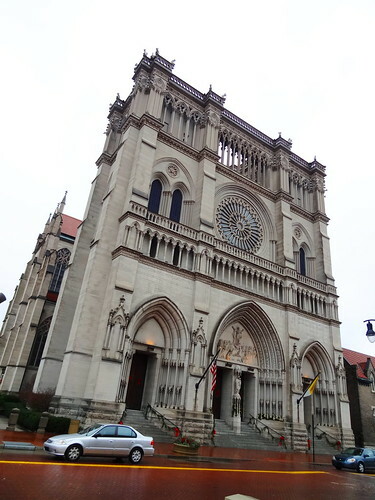 Churches obtain the title of Basilica because of their antiquity, dignity, historical importance or significance as a center of worship; St Mary’s was elevated to the rank of Minor Basilica in 1953. 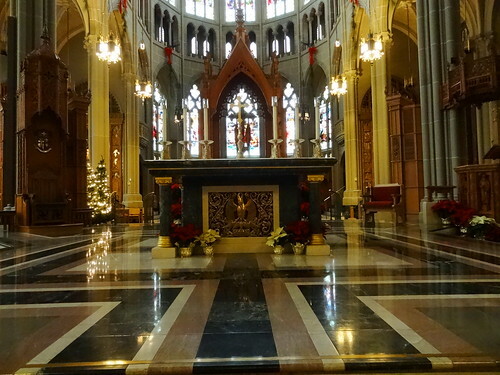 There are 35 minor Basilicas in the U.S. and 4 Major Basilicas in the world–all in Rome. No description I can give will do justice to this incredibly beautiful church, in a word, it’s breathtaking. Once inside my eyes are drawn 81 feet upward, the height of the arched Gothic ceiling, it’s incredible. 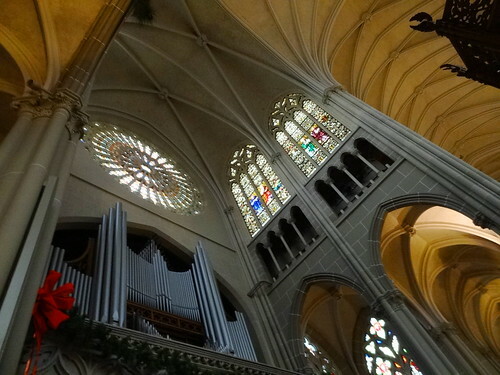 I take in fluted columns, organ pipes and magnificent stained glass windows–81 of them, made in Munich Germany. 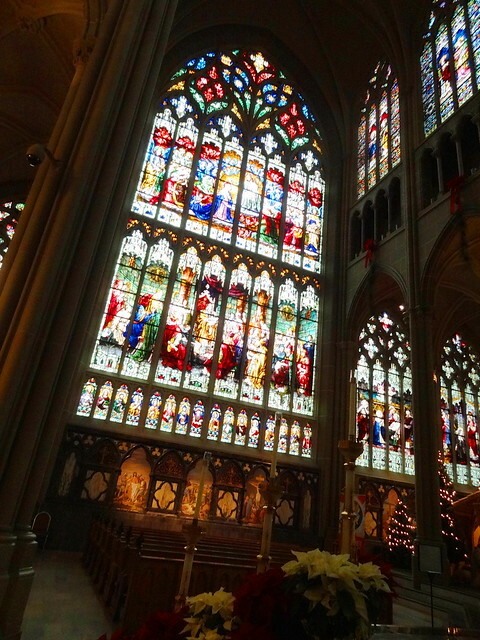 The grandest one fills the north transept at 67′ tall and 24′ wide. 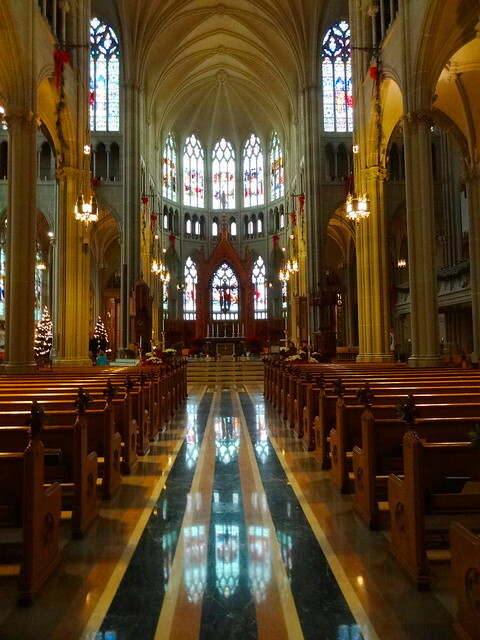 I want to walk around but my feet seem glued to the floor; I look from side to side, top to bottom, I take in the altar, rose windows, light reflects off polished marble floors. The interior is 180′ in length, transepts extending on either side give the entire edifice the shape of a cross with the apse forming its top. Kris calls my name, bringing me back to the moment. Each of us wanders aimlessly, the lighting is tricky for photos but Kris has captured some nice ones. 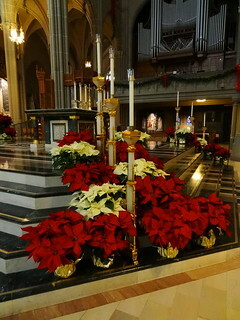 It’s late December, red and white Poinsettia decorate the church, a nativity is set up near the altar, miniature white lights are strung on evergreen trees. I walk the length of the nave to the Baptistry, 4 different types of Italian Marble were used in the construction of the octagonal font in 1934; the marble pattern of the center aisle was put in at the same time. 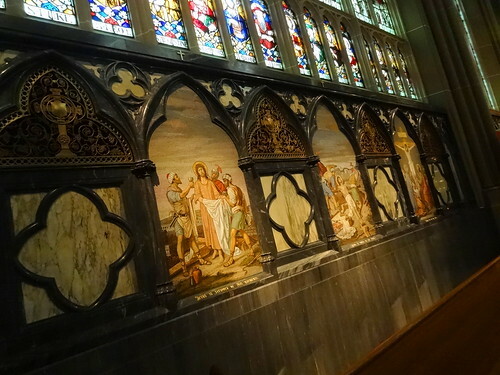 Mural paintings are the work of Covington artist Frank Duveneck and were placed on the chapel walls in 1910. There are 14 mosaic stations of Christ’s Passion and death made up of 70,000-80,000 tiny porcelain ceramic tiles with gold and mother-of-pearl highlights crafted in Venice, the detail is amazing. 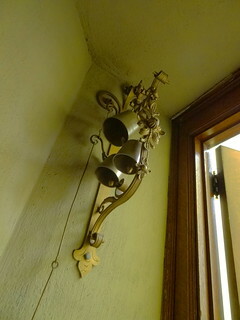 Chandeliers hang from long chains though most of the light is provided by the windows. 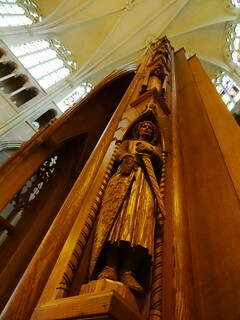 We walk up and back the center and side aisles, we amble in and out of the 4 different chapels, gawk at the Appalachian Oak pulpit, the altar table with its relief sculptures of wheat and grapes, the oak cathedra (Bishop’s chair) painted in the coat of arms of the current bishop.The carved Baldachino (think of it as an architectural canopy) over the altar features 16 prominent saints, 7 patrons of preachers surround the pulpit. 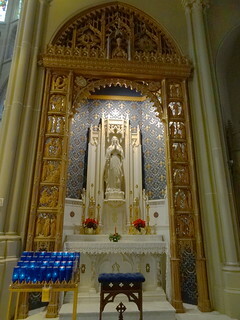 You are free to come and experience St. Mary’s Cathedral Basilica of the Assumption yourself, it’s open daily. After a little rest and relaxation at the hotel Kris and I take a walk down to an area by the river called The Banks. 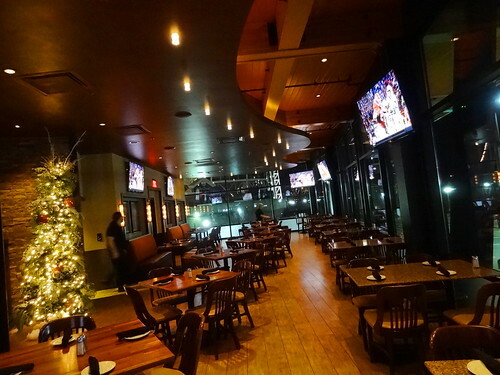 Newly opened and located between the Great American Ballpark and Paul Brown Stadium, you will find a variety of restaurants and bars. 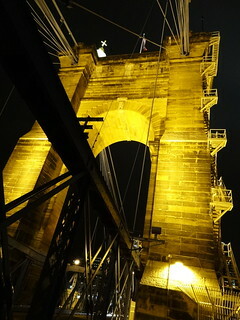 Inspired by the beautiful evening, we walk over to the John A Roebling Suspension Bridge, this was the prototype for the Brooklyn Bridge–it looks just like it. 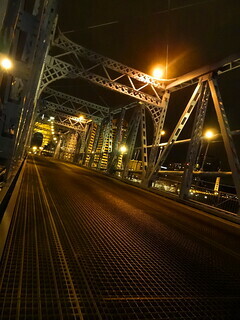 Pedestrian friendly, we decide to walk across the bridge to Kentucky and back, stopping mid-point to take in the dazzling panoramic view. 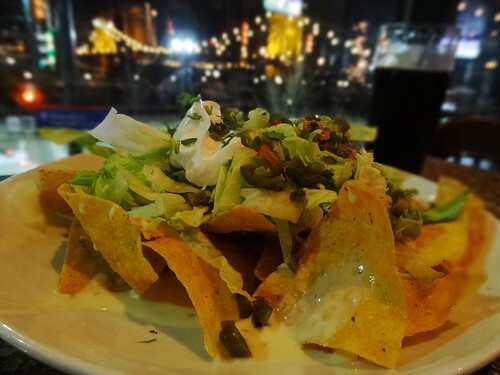 Having jump-started our appetite we decide to have dinner at Moerlein Lager House on the riverfront. 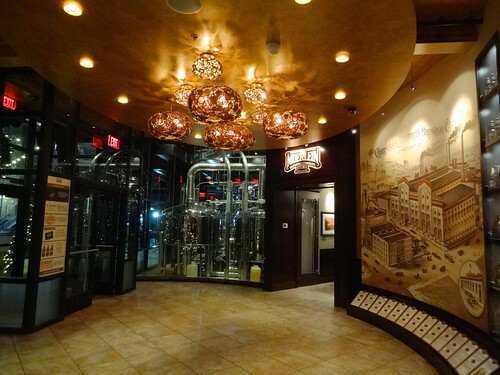 The Christian Moerlein Brewing Company started in 1853 in Cincinnati’s Over The Rhine (OTR) neighborhood. Christian was a Bavarian immigrant noted for brewing hearty European beers. His beer’s popularity extended all the way to Europe and South America. Prohibition forced the closure of the brewery. In 1981 the Moerlein brand was re-intorduced to Cincinnati, the company was bought in 2004 by beer baron Gregory Hardman. 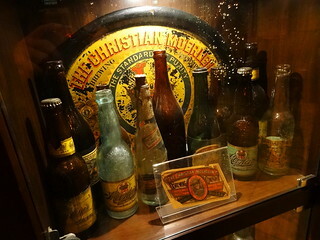 The restaurant is loaded with Moerlein artifacts from old beer cans and bottles to corkscrews, glasses and signs. The place is huge, modern, with lots of glass taking advantage of its ideal waterside location. The beer menu is endless. I order a Christian Moerlein Shiver Chai Porter, Kris chooses the Kentucky Bourbon Honey Ale, both of us are satisfied with our choices. Mine has a hint of spices–cinnamon, nutmeg, maybe clove. The BBQ Nacho plate is huge; layers of corn chips smothered in white queso, pickled jalapeno, lettuce, pico, sour cream and guacamole. Good food, good beer, good scenery and good company….. I can’t think of a nicer way to end the evening. Don’t worry, we have much more to report from Detroit in the future. If you have the time scroll through our older posts, you’ll find well over 100 on the city of Detroit.